Although this is a nicely designed mincing block combo and would make an interesting table decoration for some types of meals, it's not totally functional as it is. The idea is good, because the mezzaluna knife fitting neatly into a gap in the laminated bamboo block, and is held in place magnetically when not in use. But it's not likely to be in use unless you sharpen it, and even then it's small enough to be awkward in most user's hands. Sharpening this type of blade will be time consuming and probably not worth the trouble. A chef's knife and a cutting board make a simpler answer to mincing and dicing for anything but the tiniest quantities of herbs or veggies. The cutting block itself is nice, although again it's a little small. One side is slightly dished and the other is flat, so if you have a mezzaluna that works you can use it on the bowl side of the cutting block. 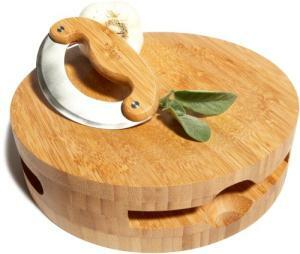 In spite of the good ideas here--the neat storage trick, and the choice of renewable bamboo instead of hard maple--unless you want a centerpiece for a sampling of cheeses and herbs, something that looks good in spite of not really being involved in the work, this isn't a very useful tool.